Our founder, John Malki, in our shop’s early years. 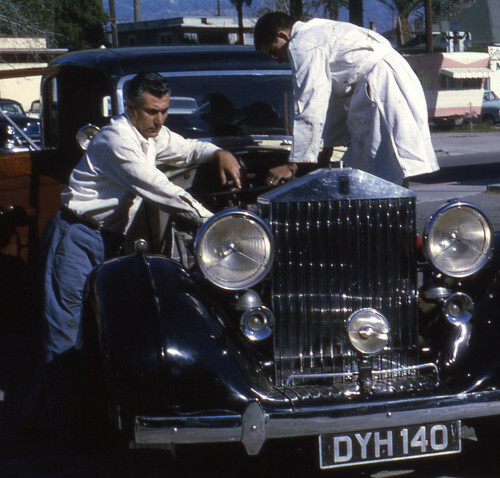 John Malki was born in Beirut, Lebanon, and was trained as a mechanic in the 1940s and 50s across the Middle East (at a time when most cars there were British, French, or German). He was sponsored for a U.S. visa and came to America in 1956. In 1957 he moved to Whittier. He lived there a year before moving to San Bernardino, where he worked as a mechanic for a Ford dealership in town. In 1960, John opened his own automotive repair business, drawing on his background to focus on imported cars. It was the first import-only repair shop in San Bernardino. On July 2, 1963, John married his wife, Linden, who became the manager of the parts and supplies half of the automotive business. John passed away in 2004, but our store is still run by Linden. Her 50-plus years of experience in the field and her deep knowledge of obscure European marques and parts makes her a unique resource unlike any other in our area. In addition to working behind the counter, she is a well respected and regular contributor to the Hillman Yahoo Group. Linden welcomes your inquiries and correspondence. You can contact the store using the form on the right sidebar of any page of this site.